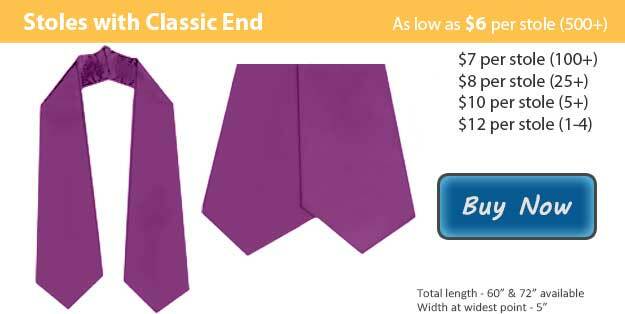 Add to the grace and dignity of your school's commencement ceremonies with lavender graduation stoles from Honors Graduation! With our beautiful stoles, made from attractive crepe back satin, you can procure high quality apparel for your graduation at a fantastic price. This is especially the case when you take advantage of our bulk discount deals! The lavender honor stoles will certainly serve as memorable tokens of each student's special day for many years to come! If you are still considering the perfect use for graduation stoles at your school, we can suggest several here. Some choose to have honor stole signify participation in specific sports, clubs, or leadership organizations. Others choose to use them to set apart students with especially high academic achievement, sometimes in addition to the honor cord. Still others find the "stole of gratitude" use perfect for their graduation. In this tradition, after commencement celebrations, students present their honor stoles to a person who has been instrumental in their success. As you decide how to utilize your lavender honor stoles in your graduation ceremonies, you may also consider the several symbolic meanings for the color. Lavender is associated with grace and elegance, so particularly if your school's motto or mission statement highlights either of those two admirable qualities, then it could bring further significance to the commencement activities. Additionally, when it comes to the presentation of higher education degrees, a lavender honor stole can represent dentistry. Or perhaps, lavender is simply part of your school colors, in which case the lavender honor stole will finish off each graduate's apparel attractively. However you choose to incorporate lavender honor stoles in your graduation, you can be assured satisfaction when you order with Honors Graduation! Place your order today, and remember to ask about our bulk discounts!